EPION Primary Care Communication Tool Now Available! The EPION PEAK Working Group is happy to announce the release of the Primary Care Communication Tool for EPI programs. Help improve your communication and collaboration with primary care by using this simple template for shared clients. Primary Care is a critical partner for EPI programs in supporting mutual clients. In order to support comprehensive care and transition between services, EPI programs have a responsibility to work collaboratively with primary care providers. Communication is the cornerstone of making that relationship as fruitful as possible. 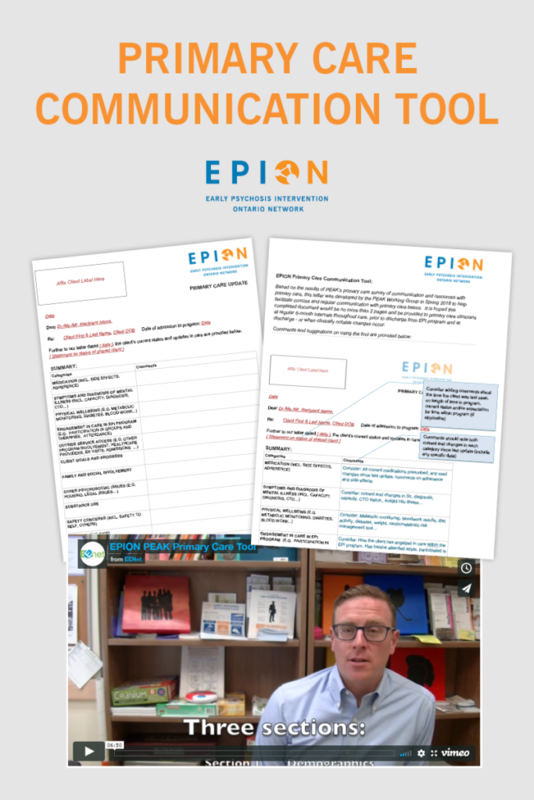 In order to facilitate this, the PEAK working group developed a simple correspondence template for EPI programs to share concise, timely information with primary care about mutual clients – the EPION Primary Care Communication Tool. What is included in this template is based on information gathered from primary care providers during a province-wide survey in November 2017. It is meant to include a comprehensive snapshot of a client’s progress in EPI care to be shared with his/her primary care provider. Our recommendation is that a letter is completed and sent to primary care providers every 6 months, as clinically indicated and/or in preparing for transition from EPI services. For more information about how to use this form, feel free to watch the instructional video below and/or refer to the explanation sheet that provides an overview of the form. We hope your teams use this tool. Feel free to share far and wide. Finally, if you are a program or individual who plans to use this tool and would like to provide feedback, please contact us at info@epion.ca.